This entry was posted in Blogpost and tagged bubble, dublin, explosive, house prices, property prices on September 30, 2014 by brianmlucey. 37 reasons Irish house prices are too high..
We need banks to be conservative, especially in the present situation. But do we want that? What would that mean? i have expressed some concern about house prices in a few place… See here, here and here as examples. This entry was posted in Blogpost and tagged bubble, CSO, dublin, economy, house price, house prices, jumbo mortgages, property on July 26, 2014 by brianmlucey. It may not be a technical house price bubble but it sure looks like one..
so…. another CSO release of house price statistics. Recall that a bubble is where prices deviate fundamentally from their warranted levels. We know that there are massive supply constraints in the dublin region so we should see house price appreciation. But this much? The largest ever year on year percentage rise ? We are back to the madness it seems. 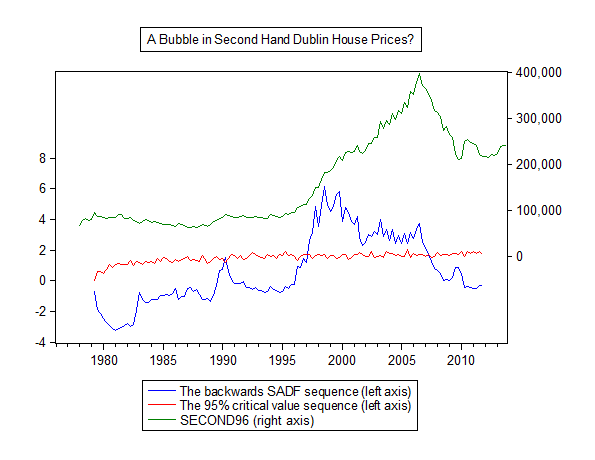 This entry was posted in Blogpost and tagged bubble, CSO, dublin, house price, house prices on July 24, 2014 by brianmlucey. 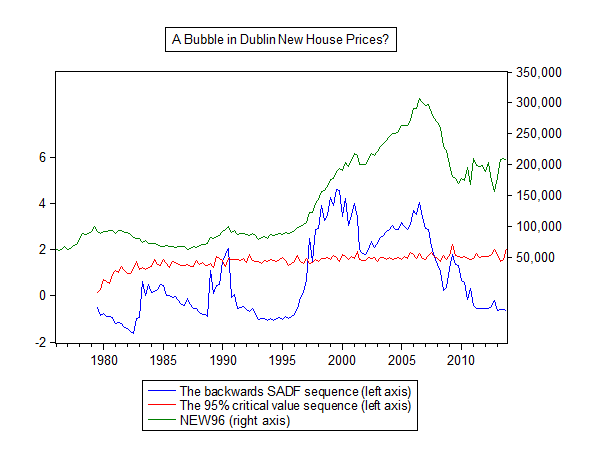 Fundamental bubbles in Irish House prices? Too late to stop a Dublin house price bubble? And on it goes. The latest house price data from the CSO indicate the two Irelands continuing to diverge. On one hand we have Dublin (and to some extent the rest of the urban areas) growing like gangbusters, while on the other hand the stagnation intensifies in the rest of the state. This is clear in both house prices and in other economic aggregates. Our geospatial policies are, and have been for decades, next to non existent. Governments have been too timid, too fearful of shortterm backlash, to put in place a meaningful strategy for growth around designated poles accompanied by real policies for the remaineder. Instead we have the irish version of Laissez Faire – Lackadasical Fear. 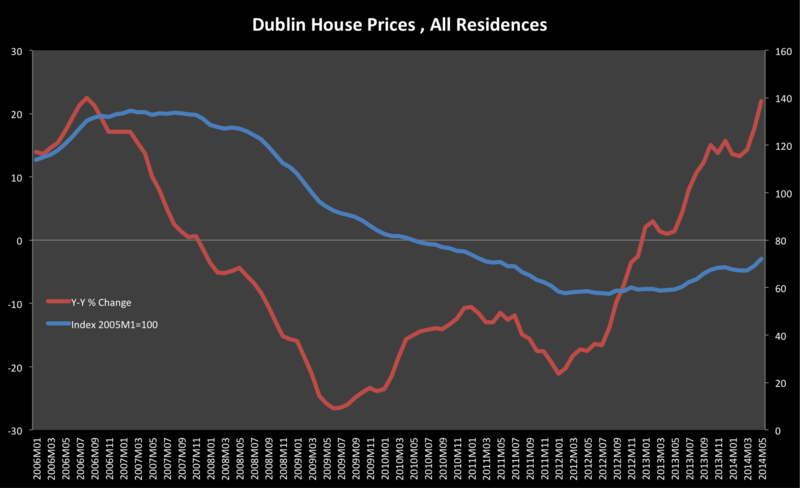 This entry was posted in Blogpost, Journalism and tagged bubble, dublin, economy, house prices, housing bubble, property on June 28, 2014 by brianmlucey. Bubbles in the Dublin Housing Market? Is there a bubble in the Dublin house market? The latest figures might well give one pause for thought, with a 22% year on year increase, clearly unsustainable. However, this may not be the entire story. A newly developed statistical technique (see here and here for previous posts using it to talk about bubbles in London and Bitcoin) has, it is claimed, good power to detect bubbles. Below see the results for real dublin house prices, 1996 prices, for new and second hand homes. We can interpret these as a bubble being present in the series when the blue line exceeds the red line. It clearly picks up the last bubble period, and interestingly dates its beginning to the 1997-1998 period. What it also shows is that there seems to be no such bubble at present. This is only a statistical test – it is by no means definitive. What is clear is that bubble or no, Dublin prices in nominal terms are rising unsustainably fast. What is your thought reader? 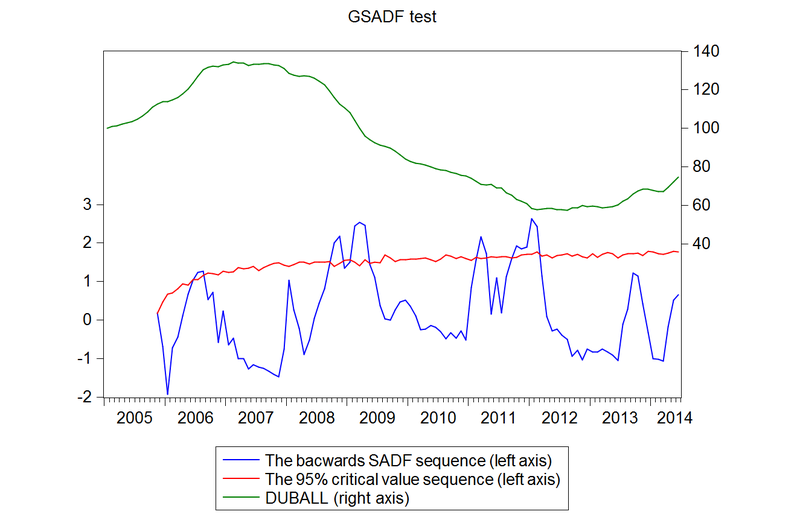 This entry was posted in Blogpost and tagged bubble, bubble period, dublin, housing, real house prices, sup-adf on June 26, 2014 by brianmlucey. Do we really need credit side intervention in the irish housing market?